John was born in Tokyo, Japan in 1971. His family settled in Grand Rapids, Michigan after stays in both Japan and Iowa. After attending various universities around Michigan, John took an education hiatus to work in a cannery in Alaska. It was there that he found his calling in the pages of American Craft while scouring the tables of free magazines at the Anchorage Public Library. He received his BFA (Furniture Design) from Northern Michigan University in 1996 and his MFA (Furniture Design) from Rhode Island School of Design in 2000. John teaches in the School of Art and Design at Eastern Michigan University. 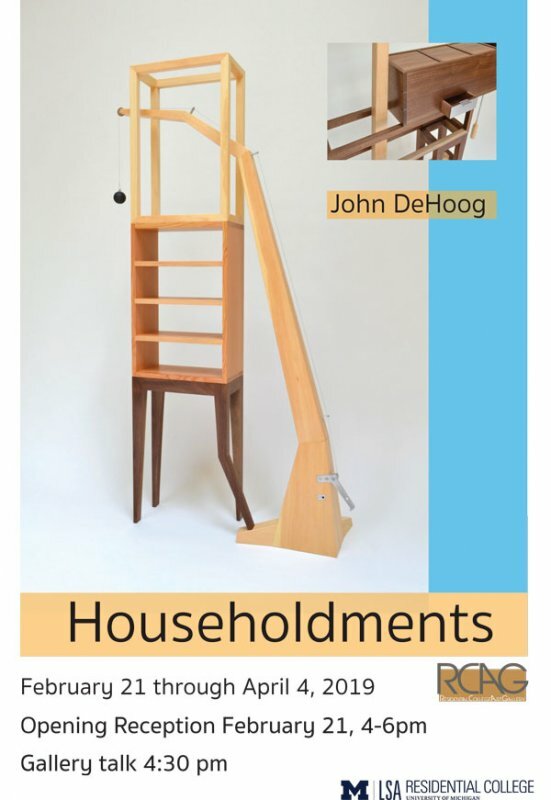 John has recently exhibited work at the Muskegon Museum of Art, the Midland Center for the Arts, the Grand Rapids Art Museum, and the Marshall Fredericks Sculpture Museum. He lives in Ann Arbor and maintains a studio in his home. While I don’t literally remember my earliest childhood years in Japan where I was born, I have over my lifetime, stitched together memories based on home movies, family photos, and images from my imagination. I “remember” the aesthetics of the place - objects and environments carefully made in wood, stone, and steel. Without necessarily conscious of it at the time, I was dimly aware of Japanese visual composition. Things around me held an inherent logic and beauty, a perfection made possible by keen tools, quality materials, and proficient makers. This three-part integration was embedded early on and continues to affect my own ongoing pursuit in object making. While finding my way as a young maker, I realized where I belonged mostly because of how various studios smelled. The ceramics studio was musty and dirty, the metals studio was acrid and smoky, but the wood studio had an earthy aroma. My kind of place. The tools immediately felt right as well. Chisels, planes, and knives when sharpened properly could manipulate the material in ways I never expected. While I was clearly not a natural talent, I quickly realized that a little bit of tenacity goes a long way. I also realized that I loved the logic for how wood parts can fit together. To build a wooden object or a piece of furniture each part depends on the fit of others. I deeply appreciate this fitting togetherness – how doors fit, how drawers fit, how joints fit, how hinges fit. It all makes sense, and this sensibility carries through to what I’m doing today. Working in wood typically requires a high degree of planning before actual construction, and over time I realized I craved the ability to work with more spontaneity. The work in this show reflects my wish to keep the working process a bit more flexible and intuitive. When starting with a sketch that I believe has potential, I now begin to build directly, without drawings or maquettes. I’ll constantly assess what has been built and allow myself to alter it, continue with it, or get rid of it and start over. I’m more interested in seeing where this process takes me than I am in finishing something precisely as planned. This results in some playfulness and whimsy that I hope is reflected in this work. 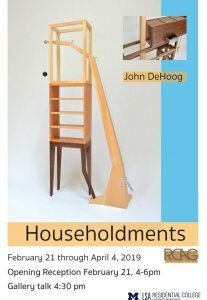 The word Householdments is an old and obscure term without modern usage that refers to furniture or things we keep in our houses. It strikes me as an odd word but well fitted to describe the objects in this exhibit. The pieces in this show are a collection of my personal householdments.